The proforma Application will be available on Commission’s Website (www.psc.ap.gov.in). Before applying for the post, an applicant shall register his/her bio-data particulars through One Time Profile Registration (OTPR) on the Commission Website viz., www.psc.ap.gov.in. Once applicant registers his/her particulars, a User ID is generated and sent to his/her registered mobile number and email ID. Applicants need to apply for the post using the OTPR User ID through Commission’s website. 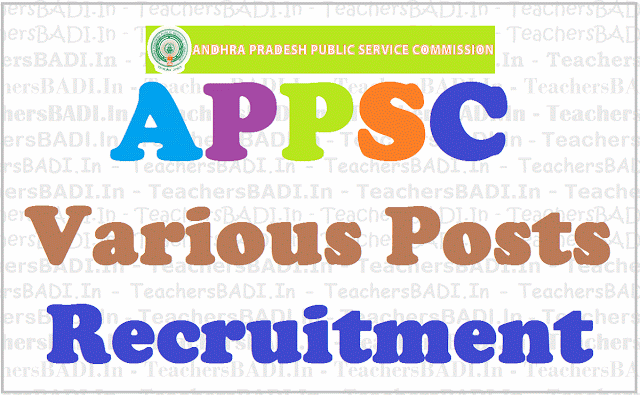 APPSC Assistant Directors recruitment 2019, Syllabus, Scheme of exam, Qualifications, selection procedure, How to apply, how to fill the online application form, Written exam date, Application fee, hall tickets, results declaration date, selection list preparation method, instructions to the candidates and more details to be announced by the APPSC Website.